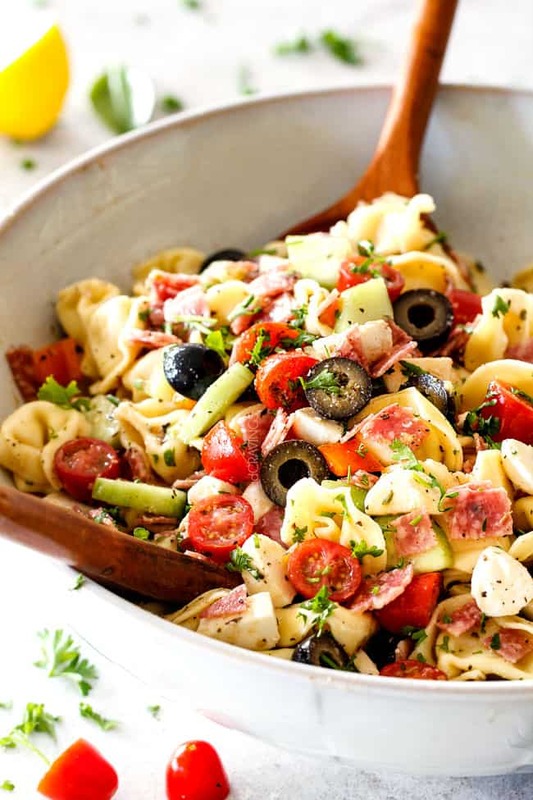 BEST Italian Pasta Salad with Tortellini! Italian Pasta Salad bursting with your favorite Italian fixings with the best Italian dressing all on your table in 25 minutes! 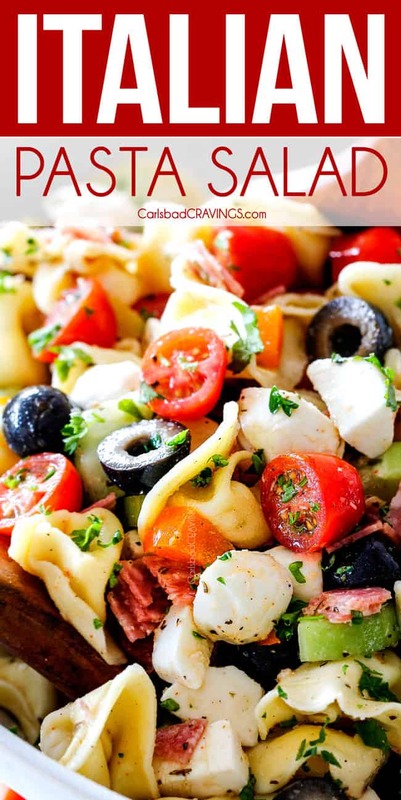 Italian Pasta Salad is an in-demand potluck, picnic and party side and this cold Pasta Salad with Italian Dressing is made 1000X better with cheesy, pillowy tortellini! 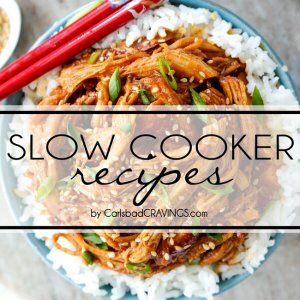 It’s a quick chop and throw together recipe that can be made 100% percent ahead of time for the perfect stress-free side! 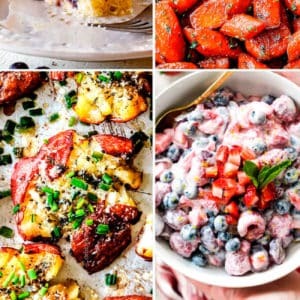 I love my Italian food in the winter months from Chicken Parmesan to Sun-Dried Tomato Pasta, and Shrimp Fettuccine, And I love my summer food too from pineapple salsa, corn on the cob, baked beans, and sweet cornbread. But what if you could have the best of both worlds? Enter Italian Pasta Salad! 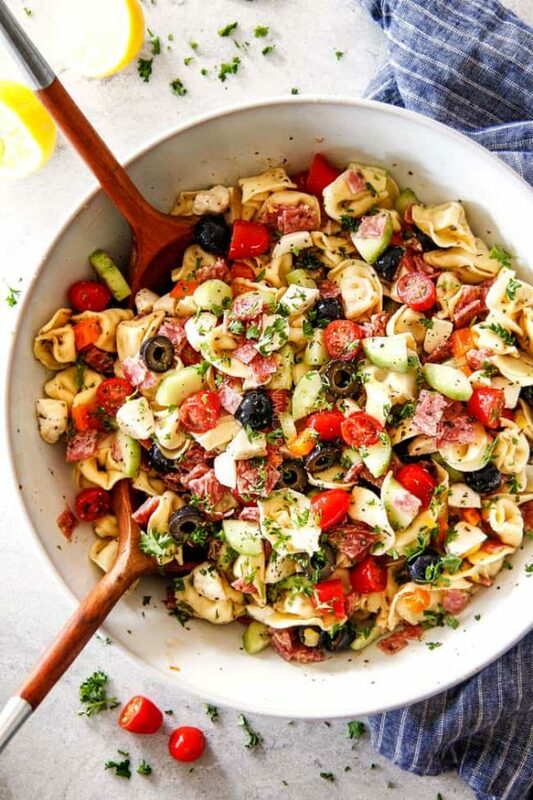 This Italian Pasta Salad recipe is loaded with cheesy, pillowy tortellini, salami, mozzarella, olives, bell peppers, pepperoncinis, tomatoes and cucumbers then smothered in bright and tangy Italian Dressing. 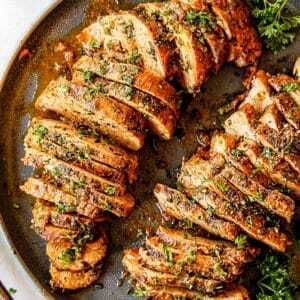 It’s hearty, comforting and refreshing all at the same time and belongs on your table all spring and summer long – starting this Memorial Day! What do you put in Cold Pasta Salad with Italian Dressing? Italian Dressing: I beg you not to, but if you must use premade Italian Dressing, then your salad will need about ¾-1 cup. Tortellini: I use fresh refrigerated tortellini. You can use any type of cheese tortellini and even think sausage tortellini would be yummy! Cucumber: You can substitute the slicing cucumber for an English cucumber and then you don’t have to peel it. Olives: I use whole olives and then chop them because they are juicer and tend to hold together better but you can use sliced olives if you prefer. Sicilian olives would also be delicious. 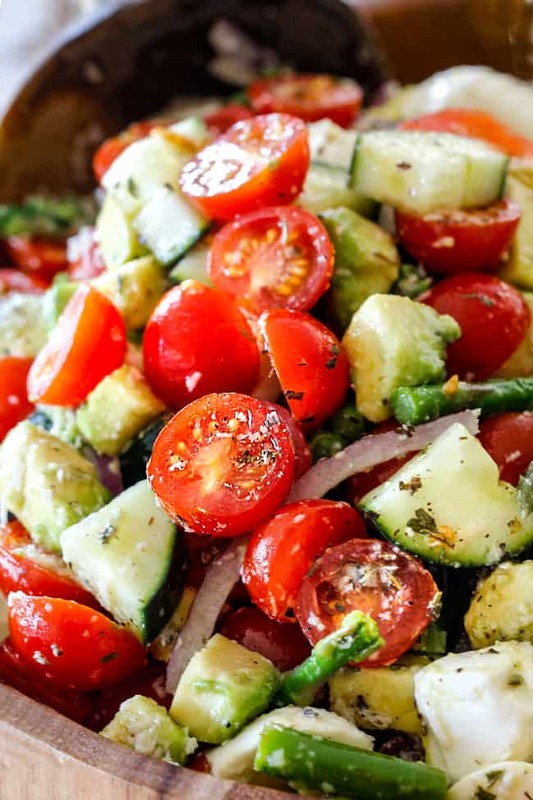 Olives are optional, and I actually don’t love olives, but I loved them in this salad! Bell Pepper: You can substitute the orange bell pepper for whatever you have on hand but my fav for this Italian Pasta Salad is orange. Pepperoncinis: Pepperoncinis can be found with the relishes and other pickled condiments. They are tangier and have a slight more kick than banana peppers but if you already have banana peppers on hand then you can use those. 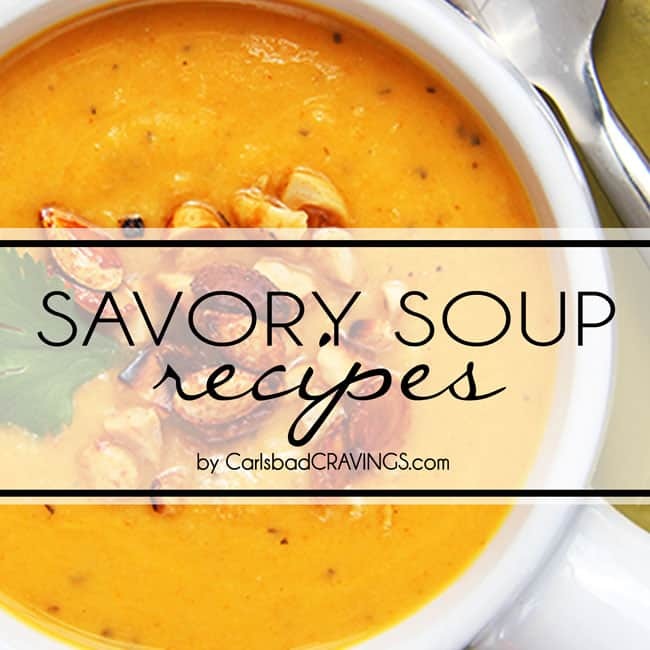 This recipe only calls for 2 tablespoons but you are welcome to taste and add more for additional tangy sweet heat. Mozzarella: I prefer to use fresh mozzarella balls, cut into bite size pieces. These can be found in the specialty cheese section of your grocery store. You can also use a fresh mozzarella log and cube it. If this mozzarella is too expensive or you don’t want to make a separate trip, you can substitute regular mozzarella and chop it into cubes. 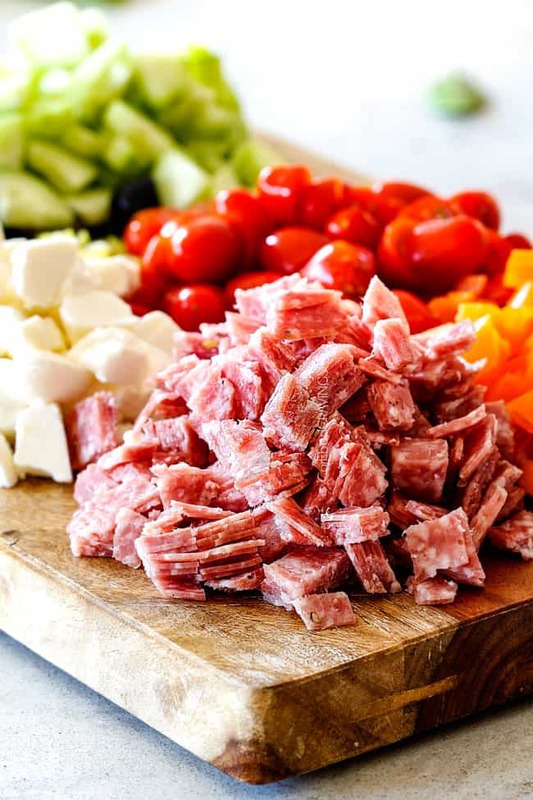 Salami: You can substitute chopped pepperoni or chopped summer sausage for the salami. Most Italian Pasta Recipes will have similar ingredients but there are a few differences in this recipe that I think make it the “best:” 1) tortellini, 2) Homemade Italian Dressing, 3) pepperoncins, 4) mozzarella balls. Tortellini: Does it get any better than your favorite pasta salad except with tender pillows of cheesy tortellini enveloped in tangy Italian dressing in every mouthful? I am obsessed. All pasta recipes should be made with tortellini in my book. 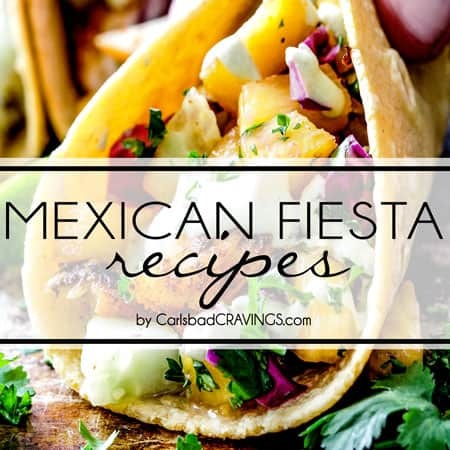 I already have shared Southwest Tortellini Salad with Creamy Salsa Dressing and have a Shrimp Po’ Boy Tortellini Pasta Salad and a Cubano Tortellini Pasta Salad with Mojo Dressing coming your way because like I said – I am obsessed with tortellini pasta salads! 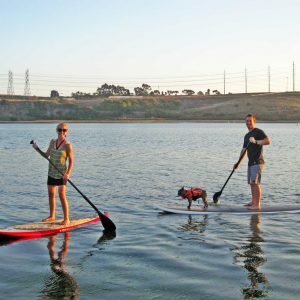 If you haven’t jumped on this bandwagon – do it! 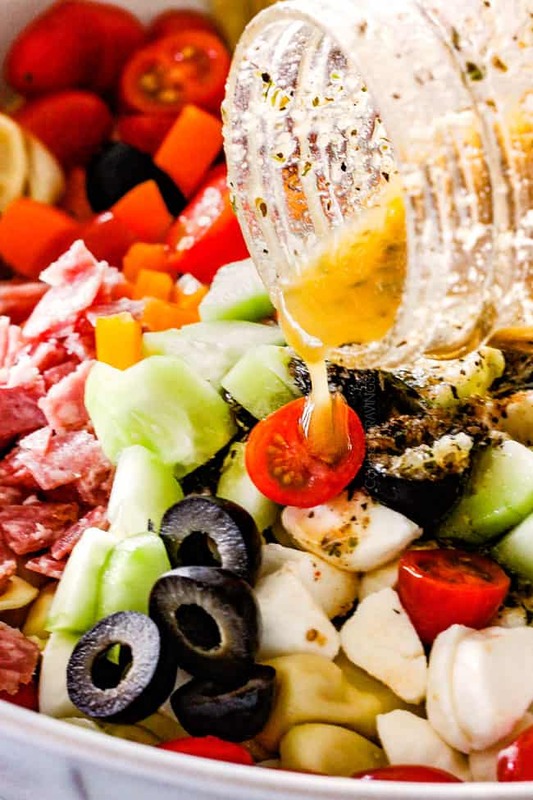 Homemade Italian Dressing: I’ve enjoyed my fair share of tasty bottled dressings, but I promise, nothing tastes as fresh and fabulous as your own Homemade Italian Dressing – and it takes MINUTES to whisk together using pantry ingredients! This easy Homemade Italian Dressing is a balanced tangy and testy blend of olive oil, red wine vinegar, dried herbs and spices and the best part – Parmesan Cheese! It elevates this Cold Pasta Salad with Italian Dressing to a whole new level because after all a salad is only as good as it’s dressing – so use the best! Pepperoncini: Please don’t skip! 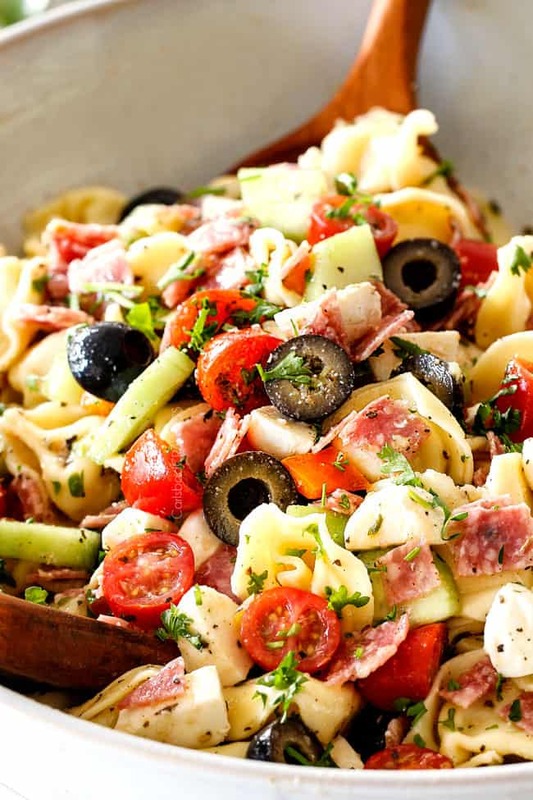 Pepperoncinis bring this Italian Pasta Salad to life! They are slightly sweet but mostly tangy with a slight zip of heat. The pepperoncini (100 to 500 Scoville heat units) is much closer to a bell pepper than a jalapeño (jalapenos are about 40x hotter) so don’t be scared away. Their sweet heat tang is explosively delicious. Mozzarella Balls: There is a reason they call them “snacking balls” because I could eat fresh mozzarella balls by the handful! They are soft and buttery and melt-in-your-mouth YUM. 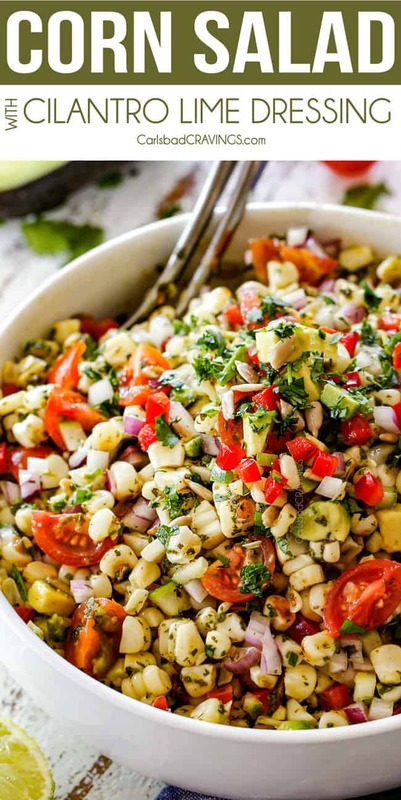 I promise you will be combing through the pasta salad just to find these pearls of satisfaction. This Cold Pasta Salad with Italian Dressing is pretty straightforward, but here are some helpful tips and tricks! 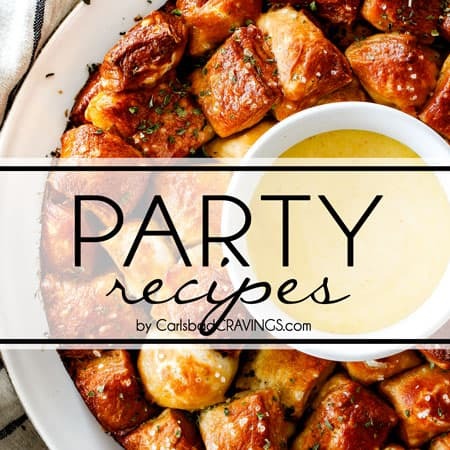 It is important to not overcook your tortellini – you want it al dente so it still has a little bite otherwise it will fall apart when tossed. To stop your pasta from cooking after it’s removed from the heat, rinse and drain it in cold water. After pasta is drained, immediately add it to a large bowl then toss it with half of the dressing. By tossing it with dressing while it’s still slightly warm, it soaks in even more zesty flavor and the dressing also keeps the tortellini from sticking together. 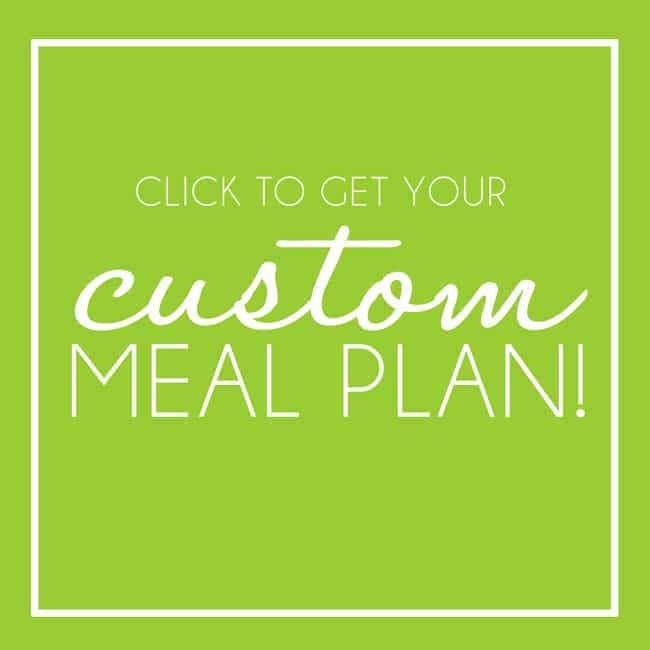 If you are serving immediately, you can go ahead and add all your chopped goodies and the desired amount of remaining dressing, HOWEVER, I highly recommend chilling for at least 30 minutes. A chilled salad tastes far superior than a room temperature one and this gives some time for the flavors to meld. Can I make Italian Pasta Salad in Advance? This Italian Pasta Salad is excellent the next day. 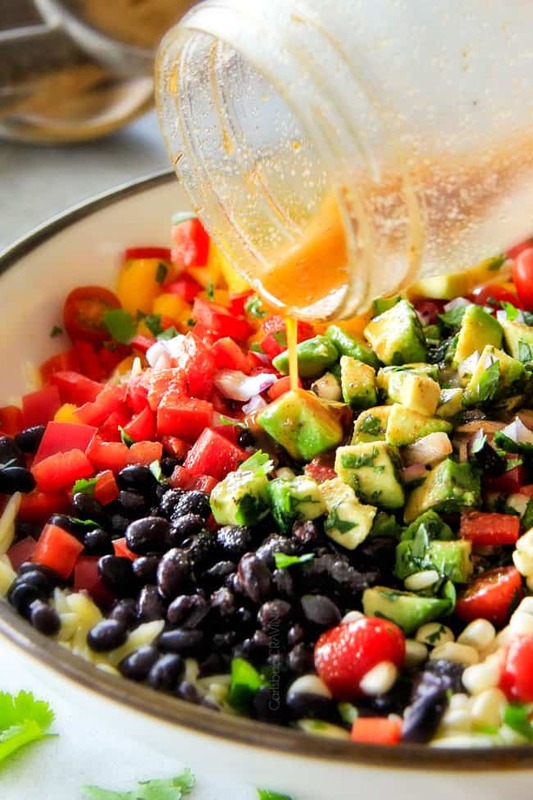 When making in advance, gently toss all the ingredients together with half of the dressing, cover and refrigerate. 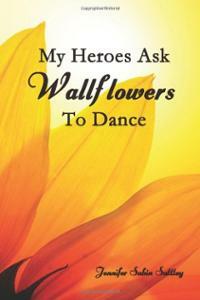 When you are ready to serve, toss with desired amount of remaining dressing. If you use all of the dressing initially your pasta may soak up all the dressing. How Long is Italian Pasta Salad Good For? Cover leftover cold Italian Pasta Salad with plastic wrap or transfer it to an airtight container. Store in the refrigerator for 2-3 days. I think it actually tastes best days after you make it! 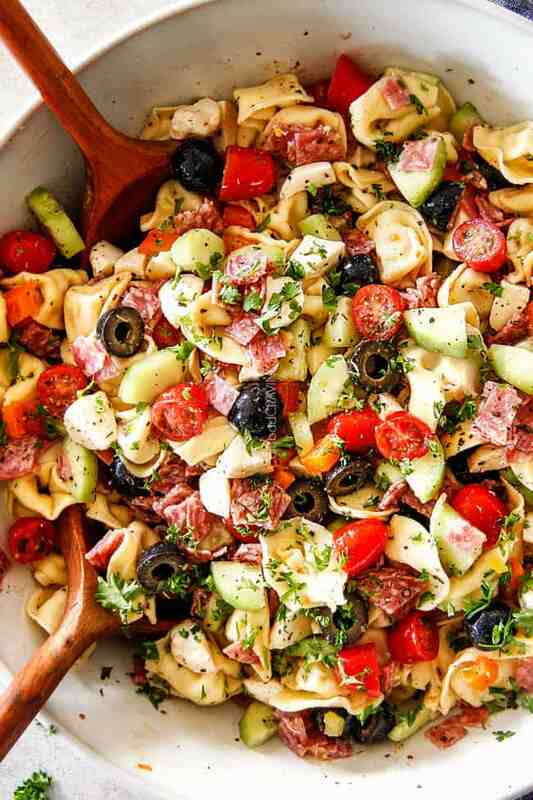 Want to try this Italian Pasta Salad Recipe? Italian Pasta Salad bursting with your favorite Italian fixings and on your table in 25 minutes! 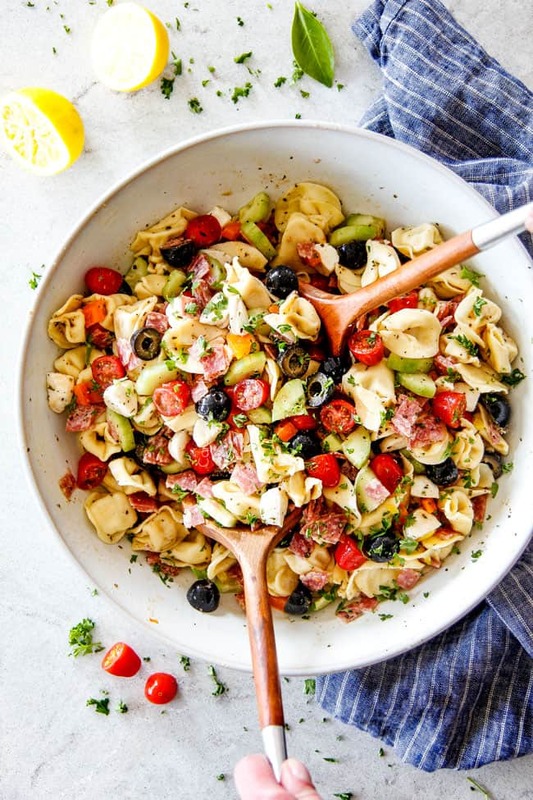 This Italian Pasta Salad recipe is is made 1000X better with cheesy, pillowy tortellini and homemade Italian Dressing! 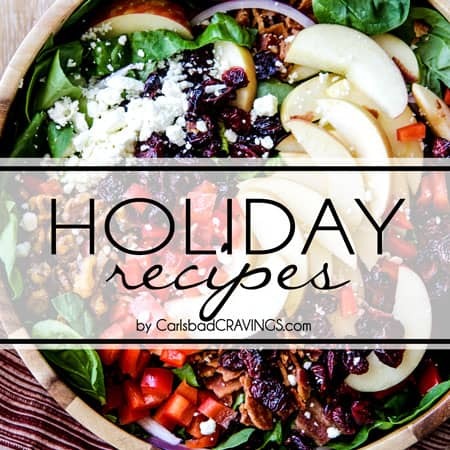 It’s a quick chop and throw together recipe that can be made ahead of time for the perfect stress-free side for all your potlucks and parties! Prepare Italian Dressing according to directions. Refrigerate until ready to use then shake or whisk to recombine before using. Cook tortellini in salted water according to package directions. Rinse with cool water, drain and add to a large serving bowl. Pour half of the dressing over the warm pasta and toss to combine. Add the remaining salad ingredients to the tortellini. If serving within the hour: toss with desired amount of remaining dressing. Although you can serve salad immediately, I highly recommend refrigerating for at least 30 minutes for the flavors to meld and salad to chill. If serving later: Gently toss ingredients to combine but do NOT add remaining dressing yet. Cover and refrigerate. When you are ready to serve, toss with desired amount of remaining dressing. 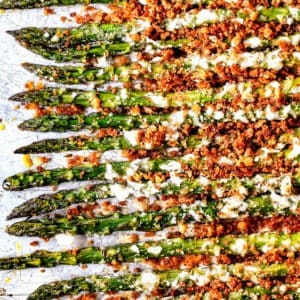 This salad is excellent the next day. Italian Dressing: I beg you not to but if you must use premade Italian Dressing, then your salad will need about ¾-1 cup. Tortellini: I use fresh refrigerated tortellini. You can any type of cheese and even think sausage would be yummy! Olives: I use whole olives and then chop them because they are juicer and tend to hold together better but you can use sliced olives if you prefer. Sicilian olives would also be delicious! 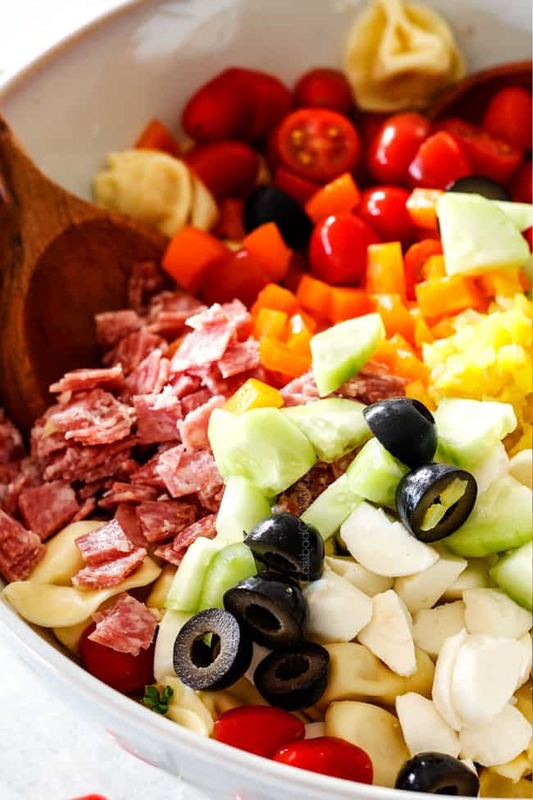 Olives are optional, and I actually don’t love olives, but I loved them in this salad! Mozzarella: I prefer to use fresh mozzarella balls, cut into bite size pieces. These can be found in the specialty cheese section of your grocery store. You can also use fresh mozzarella logs and slice into cubes. If this mozzarella is too expensive or you don’t want to make a separate trip, you can substitute mozzarella cubes. Hi Debbie, I personally used it all – its about 1 cup but you can use less if you would like. Enjoy! This looks delicious! 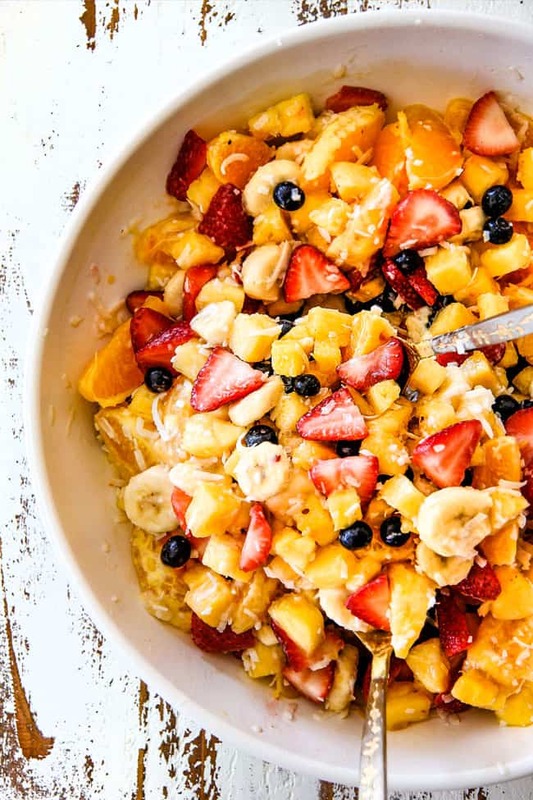 Now that it is hot and muggy here in the South, this cold salad will be perfect. Can’t wait to make it! Thank you Naomi! 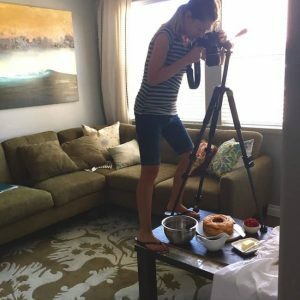 I can’t wait for you to make it either – its soooo good my husband and I couldn’t stop eating it! Enjoy! Hi Jen. 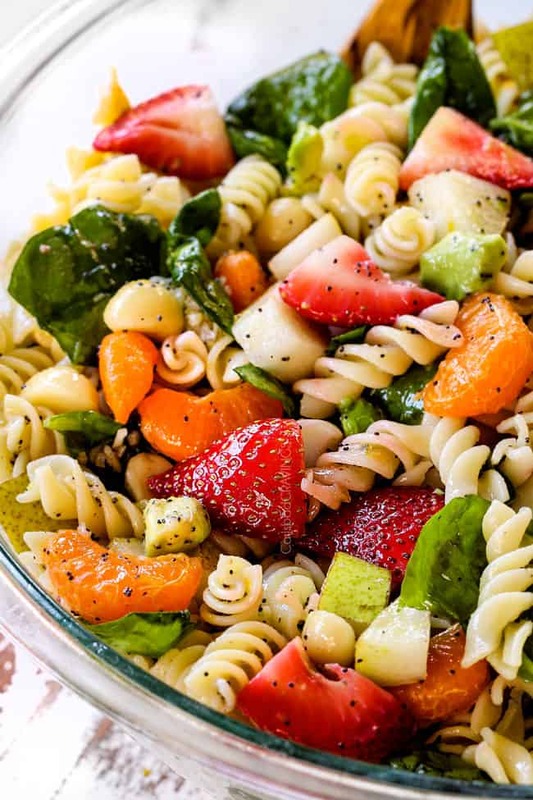 This pasta salad sounds amazing and will make it for an upcoming potluck this weekend. However, I’d appreciate some input as you’ve made this gorgeous salad. I agree with you that these salads always taste better the next day (or two!). 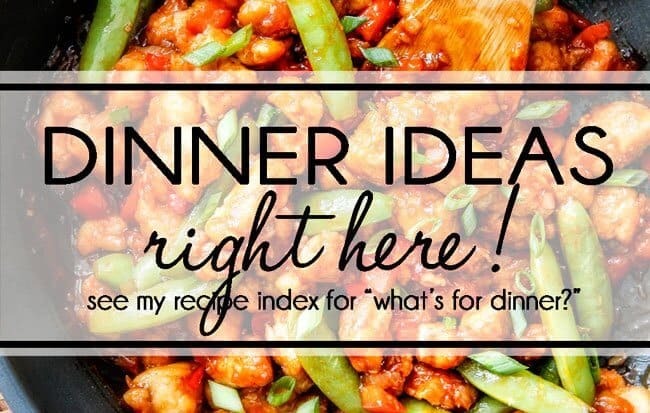 But what do you recommend regarding when to add the cut cherry tomatoes? If I add them to the salad and then they sit for a 2-3 days, will they get mushy? Perhaps I should hold off on adding them until I add the other half of the salad dressing and am leaving? Thanks Jen for an amazing recipe! Hi Karen, I am so happy you are going to make this salad soon – you will love it! I haven’t had a problem with my cherry tomatoes getting mushy the next day – if you are letting it sit 2-3 days then you might want to wait to add them. I think it mostly depends on your tomatoes, if they aren’t soft to start with then I think you should be fine 🙂 Enjoy! This was the BEST pasta salad ever!! The homemade dressing was everything and made it so much better!! YAY! I’m thrilled you made it and loved it so much! Thank you Ashley! You said this is the best, but the homemade dressing recipe is not included–at least I didn’t see it? 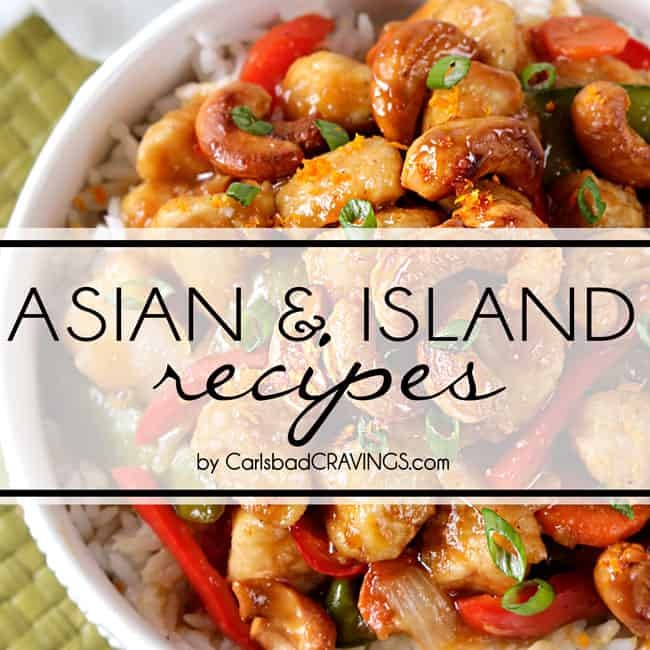 There is a link to it at the top of the recipe 🙂 Enjoy!